In all likelihood, you have never heard of Frederick, Colorado, a town of less than 9,000 people some 25 miles north of Denver. I live in Fort Collins and I probably would not have heard either of it either had I not biked through there a few times. But it so happened that one day this year—the night before my birthday in fact—I set my phone alarm to wake me up at 4:30 a.m. in order to drive over to this sleepy little town. Why? Balloons. I may be yet another year older, but in many ways I still feel like a kid. So perhaps it should not be a huge surprise that I like balloons, especially the big ones that float high in the air and can carry humans. Frederick in Flight was an event that promised the launch of dozens of these floating objects. 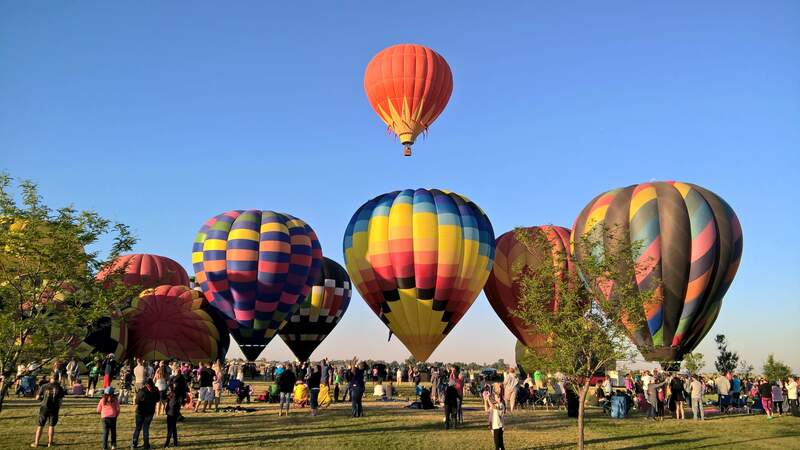 I’m not sure how long Frederick in Flight has been going on, but I figured this had to be the biggest ballooning event in Northern Colorado since Balloon Boy infamously made television headlines all over the world for a few hours one day in October 2009. The hot air balloons here did not disappoint. As you can see in this video I took, they came in different colors and even shapes. I did not get to ride in one (something I hope to do sometime in my lifetime), but the launch of balloons one by one until the whole sky was filled with them was an awesome spectacle. It was a most uplifting way to begin yet another year of my life, that’s for sure.